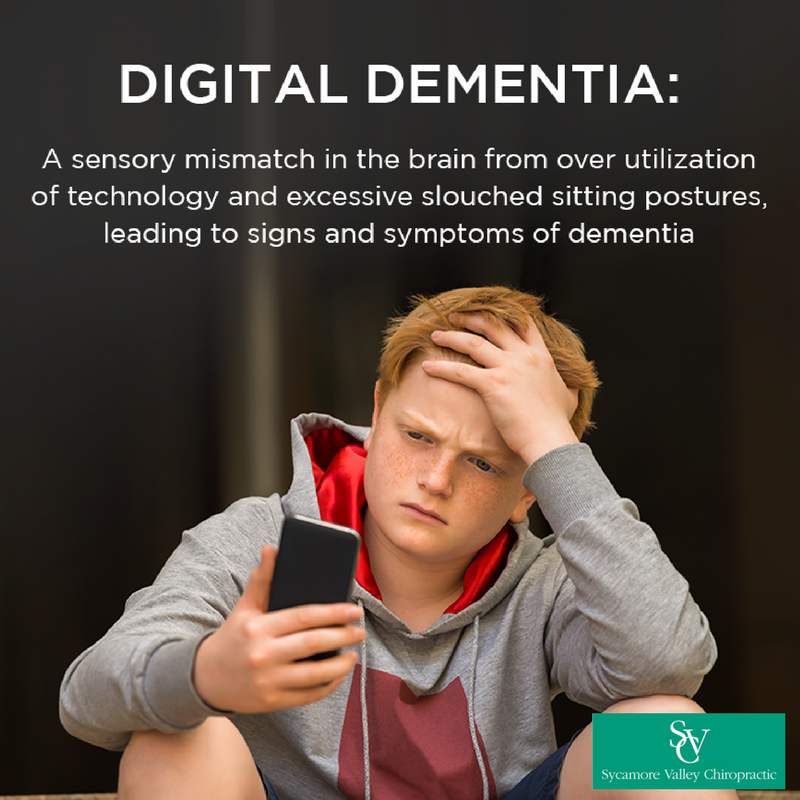 Digital Dementia is a modern day health epidemic resulting in a sensory mismatch in the brain from over utilization of technology and excessive slouched sitting posture. Adolescents with Digital Dementia demonstrate a decline in cognition and short-term memory loss, symptoms associated with dementia. Your children may be at risk for Digital Dementia if they spend hours per day seated in front of technological devices with poor posture and little movement. Signs and symptoms of Digital Dementia include: slouched posture, developmental delays, short-term memory loss, social seclusion, lack of movement, anxiety, depression, anger, balance disorders, and uncoordinated movement patterns. How does Digital Dementia develop? 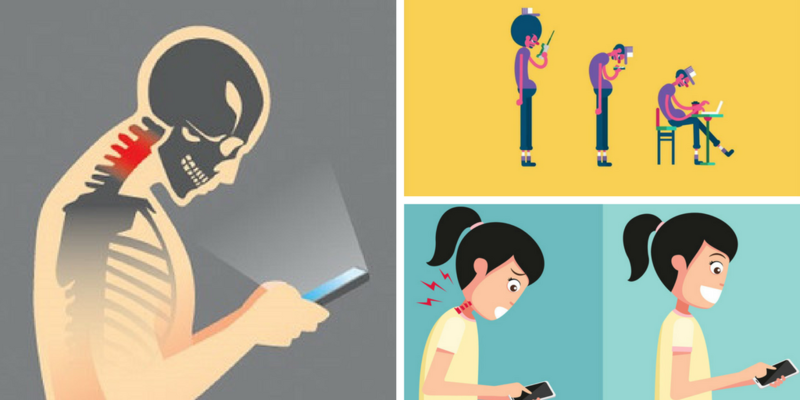 When individuals spend an excessive amount of time on their devices with poor posture a sensory dissociation occurs where the back of the brain is overactive and the front of the brain is under active. T he occipital lobe in the back of the brain processes visual signals such as visual cues from a video game, social media or TV program. While seated and engaged with technology, the front part of the brain including the frontal and parietal lobes, are under-stimulated. These regions of the brain are responsible for higher order thinking and good behaviors such as motivation, goal setting, reading, writing, memory and socially appropriate behaviors. These areas of the brain are also responsible for movement and body position sense. Posture is declining at the speed of technology. Learn how to prevent and overcome Digital Dementia with these Tech tips. Hint, Hint! Adults this recommendation is not just for your kids, it is for you too! The act of playing, especially outdoors, activates your sensory and motor cortex from movement and tactile sensation. As you are running around, jumping up and down and swinging back and forth, you are developing fine motor pathways and are stimulating the part of your brain to improve your balance and posture. “Play” is of vital importance to the development of children and for the maintenance of health of adults and the elderly. Although we can all afford to reduce your screen time per day, it is not realistic to suggest abandoning it al. together. No need to throw out your smartphone. The best thing you can do is to work on your posture while interacting with technology. When seated in at your computer, pull your shoulders and head back. Your ear should be over your shoulder and your shoulders over your hips with both feet on the ground and the spine straight. Don’t use your laptop in compromising positions. Get it out of your lap and up closer to eye level. Technology is a part of our society, there is no getting around it. How you engage with technology can change your life. Your spine is responsible for the stimulation and nutrition of your brain. Be sure to take care of it. Seek out a chiropractor to help you determine if you or a family member is suffering from Digital Dementia. If you would like to learn how to prevent and overcome digital dementia give us a call we are here to help.